Home › Blog › MT4 Vs JForex: Which Forex Trading Platform is Better? Accessibility is a major criterion for evaluating a platform. Other features such as fast order execution, better account management functionalities and user-friendly tools for market examination are equally important. The platform has to hit just the right spot in terms of its complexity; if the features are too complicated, a beginner might feel overwhelmed, but if the features are too few then the same trader might switch to a different platform when they become more experienced. This makes flexibility for customisation an important feature for a platform, as it allows it to be tailored to meet the needs of different user categories. MT4 and JForex are two of the leading trading platforms provided by Forex brokers. MetaTrader4 has been developed by MetaQuotes, which licenses its software to Forex brokers who provide it to their customers. The software is available on Windows and mobile devices and some of the brokers offer a customised version of MT4 for iOS devices as well. The platform is primarily used for margin trading and is not recommended for stock markets. While some traders use it for CFDs, it is primarily used for Forex trading. In Forex trading MT4 is one of the most popular platforms and can be downloaded for free. MT4 allows for automation of order execution through programs in MQL4 language, which is proprietary in nature. One of the most attractive features of this platform is the flexibility it offers – it allows for the construction of custom indicators, to suit the needs of different users. The simplicity and multiple inbuilt tools on the platform make it a popular choice. Localisation: Since MT4 has been so widely used across geographies, it has been translated into multiple languages which a big plus for users in non-English speaking geographies. Charts: The platform provides numerous charts which allows traders to analyse the market with a technical perspective. Expert Advisors: MT4 provides for algorithmic trading which can be used by a trader as customised Expert Advisors. Though an experienced trader might still prefer their own skills for executing orders, EAs can help novice traders learn the intricacies of the markets. Communication: The platform allows for text message based communication between a broker and customer. Customisation: The platform provides for user-based customisation on multiple fronts such as indicators, Expert Advisors etc. This allows the platform to be tailored to the user’s needs. Most Forex brokers have been offering MT4 as the preferred trading platform to their customers, and this has resulted in its high popularity among retail traders. Over time, MT4 platforms have become the industry standard, however, JForex offers a quality alternative to MT4 and provides features and functionalities on par with the industry leader. The JForex trading platform is offered by Dukascopy – Swiss Forex Bank & Marketplace. It is recommended for traders interested in manual/automated trading and developing and testing trading strategies based on the Java programming language. Functionalities – The JForex platform can be used for trading in Forex and provides for a large range of order types, including market, stop, limit, take profit, stop loss, stop limit, trailing stop etc. It also provides for slippage control mechanisms, which can be used to control maximum price slippages during order execution. The platform can be used in net position as well as hedging mode. Automated strategy visualisation – JForex enables a visualisation of the selected trading strategy based on historical data, for testing the strategy before implementation. Multiple Indicators – More than 180 trading indicators are available. 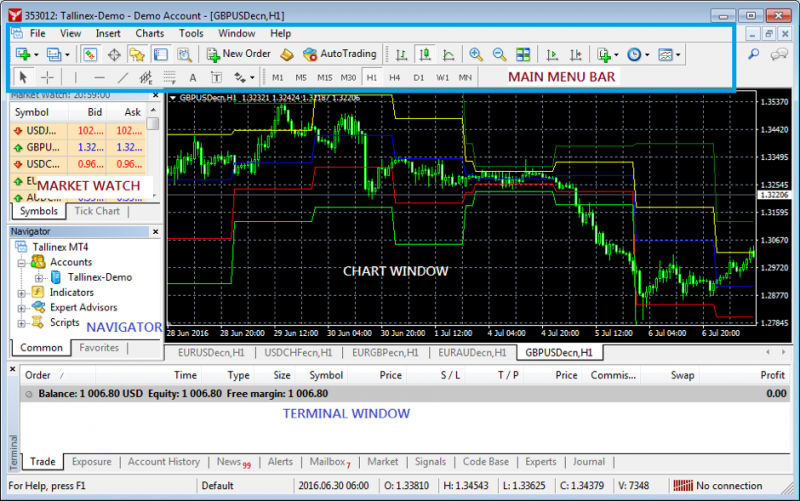 Chart Trading – JForex provides multiple elaborate charts for the user to perform their analysis. A user can choose his/her favourite charts and execute trades from the chart itself. Cross Platform – JForex works on Windows, MAC and Unix type operating systems as well. Security – Developed by Swiss Bank, the platform offers a high degree of security. The platform uses Secure Remote Password Protocol (SRP6) which ensures encryption of passwords and secure transactions. Popularity – MT4 comes out to be the clear winner as it is the most widely used trading platform and many brokerage firms provide MetaTrader platforms as a standard. Developing & testing trading strategies – Indicators and trading strategies are developed on JForex using JAVA IDE while MQL4 is used in MT4 which is a C type language. The implementation of indicators and strategy is simpler and easier in MT4, which makes it suitable for less complex strategies that can be used by beginners. But when it comes to implementing complex trading strategies, MT4 does not fare too well in comparison to more sophisticated JAVA language used in JForex. For testing strategies, MT4, like many other platforms uses an interpolation technique, which might not be very accurate. In contrast, JForex uses real-time tick data for historical tests which makes the results much more accurate. Inbuilt Tools and Indicators – MT4 provides for hundreds of useful inbuilt tools, indicators and expert advisors, while only a few are available on other trading platforms like JForex. Comparing on the basis of pre-built tools, MT4 scores above JForex. Compatibility – Standard MT4 is designed for Windows, though it runs on other operating systems with customisation, the experience is not same and it is not necessarily as stable as the Windows version. In contrast, JForex runs on Windows, Mac, and Linux type operating systems in its standard form. So on the compatibility front, JForex certainly scores above MT4. Access to Markets – MT4 can be used for trading Forex, CFDs and futures, while JForex only has access to the Forex market. Security – Both platforms look equally placed when it comes to ensuring the security of client transactions and information. Both of the trading platforms have their own strengths. MT4 is popular for its simplicity, flexibility, inbuilt tools and expert advisors. It is particularly easy to adopt as a novice, which makes it popular and is one of the reasons why it has become the market leader. MT4 is also suitable for an expert trader, however, the breadth of possibilities that JForex provides in building and testing complicated strategy is greater than MT4. Also, the OS compatibility of MT4 is limited in comparison to Jforex, which gives JForex an edge for MAC and Linux users.